Colt .223 Match Target Competition HBAR 16.1"
Description: This is a 16 inch barrel version of the Heavy Barrel Target AR 15 rifle, a direct descendant of the R6600 introduced in 1986. It is Colt's numbered model MT6731, or Colt Match Target Rifle, Competition HBAR II, with 16.1 inch barrel. It has no bayonet lug, and is otherwise a standard configuration HBAR Rifle. The barrel is a 16 inch Heavy Barrel, from chamber to muzzle. One nine round magazine is included. It will accept any AR type magazine or accessory. The overall length is 34 1/2 inches; and weight empty is 7.1 pounds. The finish is matte black with black a paratrooper stock, picatinny rail upper, picatinny fore end, and picatinny gas tube installed. 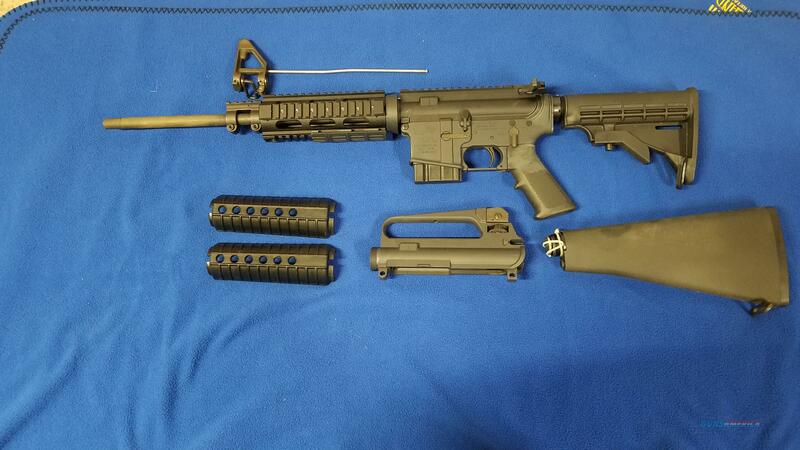 The original synthetic stock, fore end, carry handle upper, and sight/gas tube are included. Less Than 100 rounds fired through this gun.